If you want the best office chair of 2019 then we're here to help you find it. This comprehensive T3 guide to the best chairs around has been carefully compiled to unite you with the right make and model of chair, no matter what your needs, budget or body shape might be. And talking of chair budgets, with more and more sales appearing at retailers and online, there are now some amazing office chair deals to pick from – it's the ideal time to be upgrading. Follow our advice and recommendations, and identifying the best office chair deal for you shouldn't be too hard. For those of us who spend most of our working days seated, a good chair isn't a luxury extra – it's a necessity. As well as being uncomfortable, an unsuitable chair can actively damage your health by encouraging poor posture (something we know from experience). You also need to be aware that the best office chairs are expensive, and going for super-cheap for all-day use is a false economy: if you want the very best office chair of 2019, you need to be prepared to stump up the cash for it. Considering many people will happily drop a couple of grand on a sofa, the office chair should be viewed in the same light – after all, your buttocks spend more time in the office than they do in the living room. When you're shopping for the best office chair, back support is crucial, as is a seat that’s wide enough and long enough to support you adequately. Gas suspension means adjustments are easier, with many chairs offering variable resistance (so you can make them stiffer for computer work and recline them for reading, maybe). We'd say avoid arms unless they're adjustable ones, as they can lead to discomfort when typing, and if possible try and test drive chairs before buying them... we're all built differently, so the best office chair is different for everyone. Eight hundred quid may sound like a lot for a chair, but it's less than a MacBook Air, for example – and unlike the Mac, the Mirra will still be useful a decade from now. I bought one in 2004 on the recommendation of a back surgeon, and it’s genuinely the best investment I've ever made: it enabled me to get back to work much earlier than expected post-surgery, and it's kept back problems at bay ever since. It’s rock solid – two generations of dogs and two children have tried and failed to destroy it, and the only sign of wear from more than a decade is a slight bagginess to the covers on the armrests (which are almost infinitely adjustable). It's heavy, though, so I'd recommend floor protection. IKEA has a better range of office chairs than you might expect, and the Markus is our current pick of the bunch. It's not the cheapest the Swedish firm offers, but it's got just about everything you want. 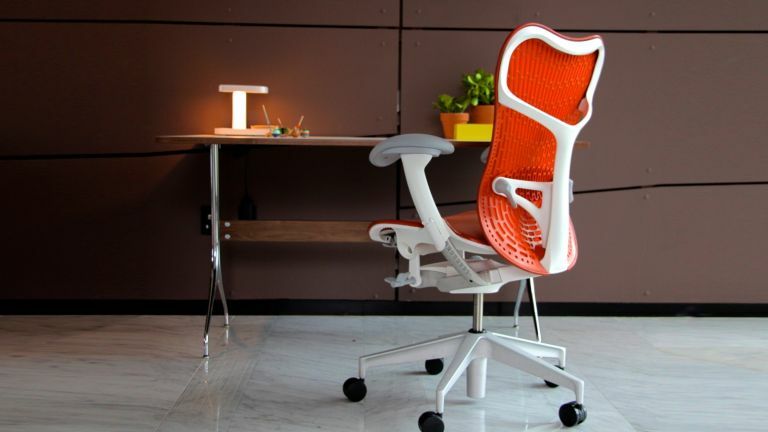 That includes a high, mesh backing with lumbar support, optional arm rests, and easy height and tilt adjustment. You can lock a tilt in place if you want to sit back and avoid work for a while. From our testing this chair can really stand up to hours of use while keeping you comfortable, and you can't ask any more than that. An easy choice for one of the best office chairs of 2019. The Aeron is an icon, beloved of the kinds of internet businesses that spent all their startup cash on expensive office chairs and went bust in spectacular fashion. But it's much more solid than those sites' business models, and if you can afford it – it’s £899 for a basic one rising to well over £1,100 for aluminium finished ones – it may well be the best place you'll ever put your buttocks. It comes in three sizes suitable for people up to 5' 2", 6'0" and more than 6 feet respectively, and it's so adjustable it feels more like an exoskeleton than a chair. It's incredibly heavy at 20kg but it’s designed for 24/7 use by people up to 150kg – that's 23 stone. It's a masterpiece. If you fancy something stylish but can't or won't drop a month's wages on a comfy chair, John Lewis has the best chair for you: the Hinton is good looking, especially in red, and the combination of gas height adjustment, armrests that flip out of the way and a mesh back make it a great office all-rounder. There's no resistance mechanism for reclining – the back of the Hinton is fixed – but the seat is well padded and reasonably sized, and it looks as good as it feels. It isn't enormous like some of the pricier chairs you can buy, so it's particularly well suited for smaller spaces – and it looks as happy in a kid's room as it does in an open plan office. One of the most versatile options in our best office chair 2019 list. Niels Diffrient was the Steve Jobs of ergonomic chairs, and his Freedom and Liberty chairs are design classics. But while they're truly excellent chairs that have become modern works of art, they aren't as eye-catching as this Diffrient office chair design: in white it's as stunning as anything Apple's ever made. There's science behind the style, too, with all-mesh seating for comfort and coolness, an exceptionally clever reclining mechanism and integrated lumbar support that doesn't require any adjustment. It's an astonishing design and comes with a 15-year guarantee – how's that for confidence? It's the kind of chair you don’t know whether to sit in or look at, and if you're the sort of person who lives in an achingly minimalist space you'll love it. Absolutely one of the best office chairs on the market right now. We've already mentioned how you often need to pay top dollar to get the best office chair, but that doesn't mean there aren't some very good value bargains out there as well. If you can't afford one of the top-end models, consider the SIHOO. For a start it's comfortable to sit in, which really helps, with a solid mesh backing and lumbar support. Plus, every aspect of the chair is adjustable, from the arm rests to the height to the level of tilt (if you need to lean back away from the desk for a while). The build quality and use of materials might not quite match the chairs that cost five times as much as this one, but this is a very solid entry down at the budget end of our best office chairs for 2019 list. The Freedom chair can genuinely be called a work of art: it's been exhibited in the New York museum of modern art and hailed worldwide as a design classic, so it's an obvious contender for our list of the best office chairs of 2019. It's hardly cheap, but it'll still set you back less than a MacBook Pro and it'll last a whole lot longer: buy it from John Lewis and it's guaranteed for 15 years. We're into jargon territory here: there's weight-sensitive reclining, synchronously adjustable armrests and a dynamically positioned headrest – in plain English that means it adjusts to your shape and movements to keep you perfectly comfortable without requiring you to mess around with tension adjusters or levers or the other bits and bobs you find on other ergonomic chairs. Another design classic, another 15-year John Lewis guarantee – although you might want to shop around for this one, as the Liberty is available in a wide range of colours from other retailers. You can configure the Liberty with or without arms, upgrade to a gel seat, specify hard floor castors instead of the default carpet ones, and choose upholstery and back colours, and while most options cost money even a fully tricked-out Liberty can be found for less than the RRP. It's a superb, stylish and very supportive chair, and once again it's the work of legendary designer Niels Diffrient – so that means intelligent, self-adjusting comfort without the need to fiddle with anything. Herman Miller hasn't rested on its Aeron-shaped office chair laurels: its SAYL chair looks like nothing on Earth, especially if you opt for a red or green one, and it boasts some really clever engineering. The frameless back is designed like a suspension bridge, and while it looks like it can't possibly support you, it turns out to be strong, supportive and very flexible. The mesh of the back is stronger in some parts than others to encourage correct posture, and it's as happy reclining as it is keeping you upright. As with other HM office chairs, John Lewis offers a 12-year guarantee on this one, and we'd be surprised if you need to take advantage of it. This is a chair that's absolutely built to last, and is well worth a place on our best office chairs 2019 list. We love unusual and off-the-wall designs here at T3 and this design from Norwegian brand HÅG offers subtle Scandinavian minimalism and ingenuity. It looks and functions much like a cross between a regular office chair and a stool, providing you with lumbar and lower back support while forcing you to maintain your natural sitting posture. Perfect for users who tend to move around/get up a lot during their working day, the HÅG Capisco Puls 8010 is comfortable to use and can be tilted and adjusted in terms of its height and the depth of its seat. It is a little pricey, but it's also one of the most eye-catching designs on this list.